Export 10,000 products from Opencart to Excel with 5 MB of RAM in 2 minutes. Opencart has long needed a flexible import export tool. All the available extensions only offer predefined configurations, but what if you need something custom. With Flexible import-export you can have anything you need with custom filtering and more. 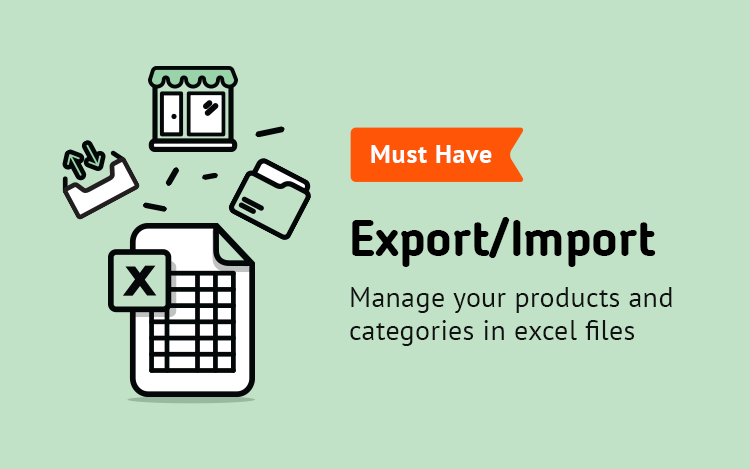 Enjoy a quick and easy export to excel of thousands of product. This is because we are using a new php excel library that doesnât require any CPU and large data sets are divided into small chunk that are written to a file on your server so you donât have to freeze your shop just to make a simple export. We built the Export Import extension to be as much flexible as possible. You can set any filter you need to get exactly the right amount of data required. The Import Export module is the first extension that you can extend to fit your needs. We all have custom web shops and often you need a custom excel file exported and then imported. Well now you can by adding a special config file. Ask us or your developers to create one for you. We made the foundation of our Import Export file open source so that you can get the best product the community can offer. You are free to add custom filters and extend its functionality as you need. Implement it in your next theme or product. Just put a link to us as a "thank you". We like excel very much. Its simple and gets the job done. So we really like this extension that allows you to export all your products to excel, edit them and import them back in. Be careful though.